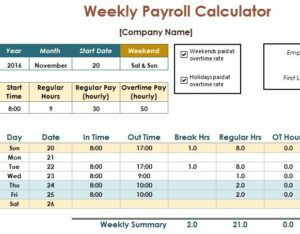 Running a business is hard, why not making it easier on yourself by downloading the free Payroll Calculator Template today. This template cuts out one of the most tedious and time-consuming aspects of owning a small business. You can quickly and easily calculate the pay for each one of your employees with this simple template. You can even give each of your employee’s their own page on the document as well, making organization a breeze. If you’re ready to get started with this free template today, then simply follow the set of instructions we have conveniently provided below. To download the free template file, all you need to do is scroll to the bottom of this page and click the link below. When you open the document, you’ll notice there are 3 different tabs at the bottom of the page. These are for weekly, bi-weekly, and monthly payments. Choose that one that applies to your organization structure. When you choose one of the pages, you’ll find the same structure throughout. You have the date in the top-left comer and the employee to the right. Below, is the table where you can track that employee’s hours. There are a few examples to show you how to use the template, but you will replace them with your own information. The template will take the hours and calculate the amount you need to pay them. You can also copy the page as many times as you’d like to make a separate page for each of your employees. To copy a tab, right-click on it and select “Move or Copy” and choose the item you want to copy. You would then check the “Create a Copy” box. Save yourself some time and energy by downloading this free template today!